Adapter One Plus is identical to Adapter One, except for the extra four pin XLR chassis connector; now you can tap into an external battery and get a more robust and safe connection to your power supply. Adapter One Plus connects the FieldCast™ Cable straight to Blackmagic Design’s famous ATEM Camera Converter™, and completely and effectively protects the vulnerable fibre optic LC connections to the SFP of Camera Converter™. Adapter One Plus brings all advantages of Adapter One, and adds a four pin XLR chassis connector for tapping in your power supply or battery. Now you can go into the field with an extra battery pack to feed your Camera Converter or recharge its battery with power supplies that use standard XLR connectors! If you want to be sure that your Camera Converter has a tight, standard, low cost, available connection to external battery or power supply, go for Adapter One Plus. And if you want to keep your costs down maximally, substitute the laptop connector on your Camera Converter power supply for a female four pin XLR connector, and you can continue to use it. 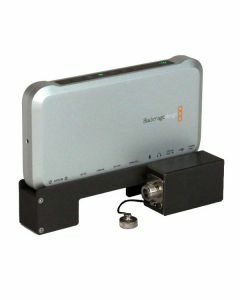 The adapter features a FieldCast 2Core Chassis Connector, so you can connect the FieldCast 2Core SM (single mode) Main Cable to Blackmagic Design ATEM Camera Converter, fast and easy. Also features a Neutrik four pin XLR chassis connector, so you can connect an external battery pack to Camera Converter by simply using a standard adapter cable with XLR four pin female cable connector. Taps into the power connector of Camera Converter using a 90 degree power plug. This does not change the functionality of the unit. Robust all aluminium solution, built around a milled out block completely covering and protecting the vulnerable LC connections to the SFP of Camera Converter. Mounts to the back of Camera Converter using the four taps of its housing; no customizing, no drilling, no glueing whatsoever.